Voice-activated digital assistants such as Apple’s Siri and Amazon’s Alexa are all the rage in consumer electronics right now, and some developers are beginning to apply this technology to the trucking industry to enhance safety and efficiency. While these types of trendy innovations sometimes come and go, transportation technology experts said voice assistant programs are more than a passing fad and hold the potential to reduce distracted driving and streamline work tasks. Voice assistance “makes the whole experience with a device more seamless,” said Venky Rao, director of product management at Rand McNally. 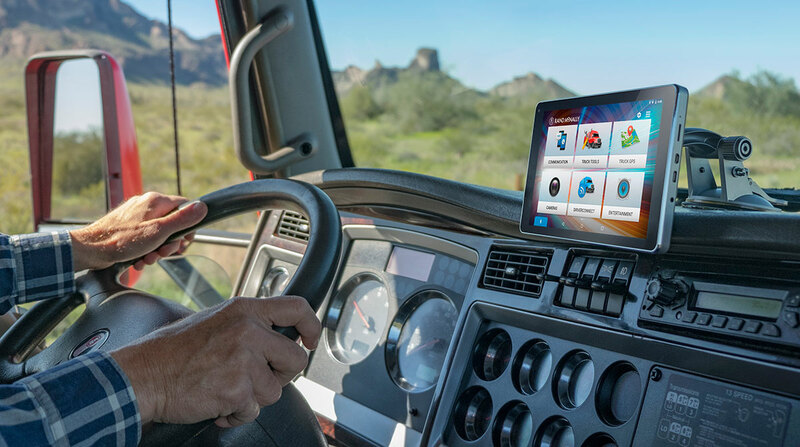 The company has made voice assistance a staple for its OverDryve in-cab truck navigation and electronic logging devices. The voice-responsive technology is “not something we tried to monetize. Rather, it’s in place to make the whole driving experience ­safer,” Rao said. Voice commands enable drivers to send and receive important information without taking their hands off the wheel to launch an application on a device. “Today a truck driver has to pull over to interact with a device … but voice is a much safer way” and seems to be a natural fit with the trucking industry, said Ramprasad Renganathan, data scientist at Omnitracs. The longtime supplier of in-cab mobile communications systems has introduced a hands-free voice interface on its Intelligent Vehicle Gateway platform. Developers also are examining ways to use voice assistance to support fleets’ back-office operations. Omnitracs recently worked with Birmingham, Ala.-based P&S Transportation to create a voice-assistance program designed to make it more convenient for fleet managers to check the company’s performance data. The team created an Alexa “skill” — essentially a voice-command app — for the Amazon Echo and other Alexa-enabled devices to access the fleet’s operating data when an authorized fleet manager utters a voice command. “Fleet managers are very busy,” Renganathan said, and this Alexa skill allows them to log into multiple systems to get all of the information they need without navigating to each system separately and pulling up different data sets on computer screens. “We aggregate all the data and they can just ask questions” and receive verbal answers about the business summary, Renganathan said. The program covers 16 metrics, including revenue, hours of service, the number of loads delivered and driver retention and recruiting. Mauricio Paredes, vice president of business technology at P&S Transportation, said some of the fleet’s managers initially were skeptical about the benefits of voice assistance prior to bringing it in-house, but “people did get very excited” about the technology after becoming familiar with it. The Alexa skill works as part of Amazon Web Services’ enterprise offerings, but “it’s not generally available to everybody who has an [Echo] device, only for those authorized with the Alexa skill,” which enhances security, said Brad Taylor, vice president of data and Internet of Things solutions at Omnitracs. Now P&S is working with Omnitracs on a second release of the skill with upgraded voice-command capabilities. While fleet managers currently can ask Alexa to read the business overview aloud, the goal is to make the next version more interactive and capable of reporting increasingly specific data when asked a wider array of questions. That desire for more responsive functionality represents a challenge that tech developers throughout the industry aim to solve with ongoing research and testing. Right now, developers must program voice assistants with each “question a customer might ask, and all of the other variations of that question,” Renganathan said. Today a truck driver has to pull over to interact with a device … but voice is a much safer way. In the P&S case, for example, that might mean programming the system to read company performance data if a user asks for the “daily report,” “business summary” or dozens of other iterations of the same request. “The system is not smart enough yet to intelligently know what the user is asking” and respond in kind, Renganathan said. But future iterations should be able to understand complex human commands and provide correct, detailed answers. These systems will become increasingly adept at tailoring responses to each human user’s patterns and needs, even to the point of becoming predictive. In the years ahead, integrating voice-­assistance features into telematics systems with predictive analytics could support drivers in a variety of ways. Future systems could issue pre-emptive verbal warnings when the technology anticipates a maintenance problem, rather than relying on a dashboard light when a problem arises. “There’s a lot of technology around the engine fault information that’s been captured for many years, but it’s usually used by maintenance after the fact,” said Eric Witty, vice president of product for PeopleNet. Other future applications could involve the voice assistant telling drivers about lane deviation or announcing detailed descriptions of ­upcoming road obstacles. The technology could provide verbal load delivery instructions, or even activate and contact the appropriate authorities if a driver is in danger and calls out for help. The common thread for nearly all driver voice assistance technologies remains safety, developers said. “The immediate focus for us on the in-cab side is any time there’s a distraction,” Witty said. PeopleNet has not released voice-assisted fleet management products, but the company is investigating ways to use the technology “to remove the distractions and provide an alternative method for the drivers to get access to data or send a message,” he said. Developers continue searching for additional ways that fleets can use voice assistance inside trucks and in the back office. Omnitracs’ current work on the Alexa responsiveness “is really just a first step to make sure we understand how to do this securely, and the challenges,” Taylor said. A problem that has slowed the release of some in-cab, voice-­assistance products is the fact that the trucking environment tends to create ambient noise, which interferes with the technology’s capabilities to understand and respond to human voice commands. Technology companies also must weigh whether to move forward with their own voice-assistance products or wait a bit longer to see how much original equipment manufacturers incorporate the innovation into new vehicle models. “Folks like us that work closely with and partner with OEMs are curious as to what smart trucks will look like in the future so we know what capabilities already will be there,” PeopleNet’s Witty said. In the commercial van space, for example, the new Mercedes-Benz Sprinter offers voice-command capabilities on the vehicle’s MBUX infotainment system. As technology vendors and vehicle manufacturers continue to explore the use of voice assistance in trucking, fleets will need to consider whether to become early adopters or wait until the technology becomes more widespread. At P&S Transportation, the Alexa skill “has well served its purpose” in the few short months the company has used it, Paredes said. “In trucking, one thing you have to get past is, ‘We’ve always done it this way.’ That’s not a hard thing to get over once people see the benefits,” which happens quickly with this innovation, he added. Paredes recommended that carriers consider adding voice-­assisted technologies earlier ­rather than later to increase both ­efficiency and safety. “Bring in the technology, but make it useful from day one. … If you wait until everything is already mass adopted, you’re likely behind,” he said.